I know this photo is from December last year but I couldn't help but dig it out for a fresh airing. 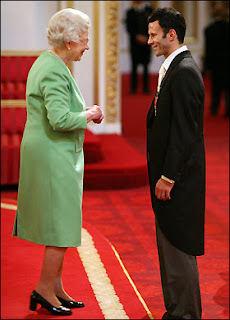 It's Manchester United living legend, Ryan Giggs, receiving an OBE from the Queen herself. Ryan is class personified. Can't wait for the season to start on August 16! Yay! Thanks for the Ryan love, LTG. This is one of my absolute favourites of my Ry 'cause he just looks chuffed to bits to meeting Lizzy. And he looks adorable in his morning coat!